July 11, 2018, 8:54 a.m.
With the Theresa May’s premiership looking increasingly tenuous following the resignations of key Brexiteers from her cabinet, there has been inevitable speculation that the Prime Minister could be ousted as leader of the Conservative party. This would mean that the next occupant of Downing Street could be decided by around 100,000 Tory party members. 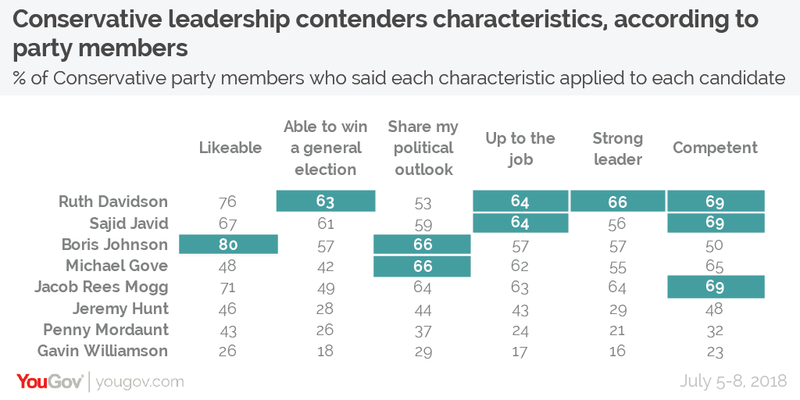 Last weekend YouGov surveyed nearly 1,000 of them, using the data to analyse their views of eight leading candidates, as well as modelling 28 hypothetical leadership elections. In both cases the data points towards a new frontrunner for the top job. 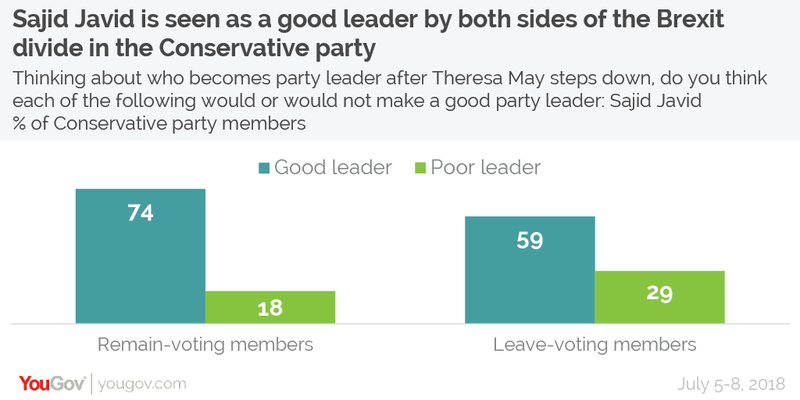 When we last ran a leadership poll in September 2017, just 29% of Conservative party members thought that Sajid Javid would make a good Tory leader. Of the 11 potential candidates we asked about he came in ninth. But in our latest research he has leapfrogged most of his competitors, with 62% now saying he would make a good leader. This means a third of the party’s membership has formed a positive opinion of him over the last ten months. Under Conservative leadership election rules MPs vote to whittle candidates down to a final two, who are then put to the full party membership. We modelled al the possible combinations of contest between eight likely candidates. 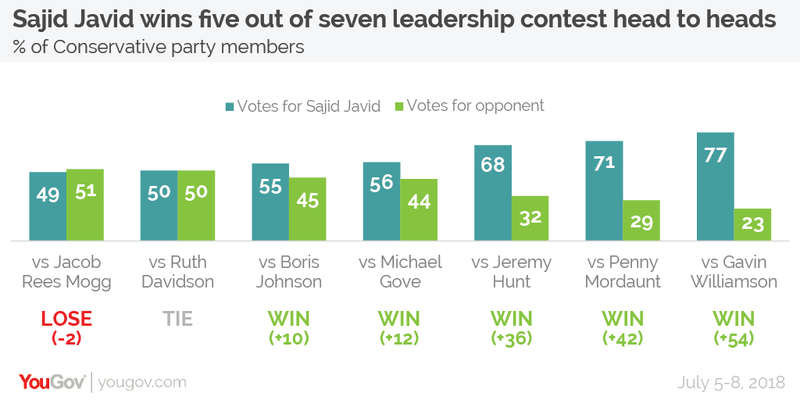 Sajid Javid wins five of these battles – beating Boris Johnson and Michael Gove by 10 and 12 points respectively. The data suggests Javid would lose to Jacob Rees Mogg, but at 51% to 49% the narrow defeat falls within the margin of error. Against Ruth Davidson – leader of the Scottish Conservatives – it is a score draw, with each candidate on 50%. However both of these potential adversaries will find it difficult to get down to the final two in the first place. 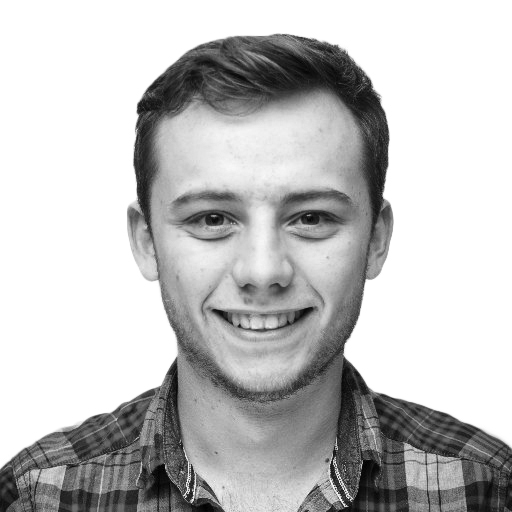 Rees Mogg may struggle to get enough support from Tory MPs to make a run-off and Davidson is not currently an MP (and has also strenuously rejected calls to make the shift from Holyrood to Westminster). So what is driving these high levels of support for Savid Javid? Firstly, since out last poll of party members Javid has been appointed Home Secretary, replacing Amber Rudd who resigned over the Windrush scandal. This has given him a bigger platform on which to present himself to the membership. The increase in his public profiles has seen the number of members who tell us they “don’t know enough” about him falling from nearly a quarter (23%) in September to just 4% now. Secondly, he is the Remainer who best appeals to the Brexiteers within the membership. Considering he supported the Remain campaign it is not surprising that three quarters of Remain voters (74%) think he would make a good leader, but his lukewarm support for the European Union, and the fact that he has since come out strongly in favour of following through on Brexit, means that a majority of Leave members (59%) also think he is a good person to head the party. In terms of how they voted at the EU referendum the party membership breaks down approximately 70/30 in favour of Leave. Nevertheless, Remain voters still constitute a sizeable minority within the party’s ranks. This means that the best way to guarantee high levels of support is to build a coalition than runs across Brexit lines, a similar strategy to the one Theresa May used to win the leadership in 2016. Finally, Javid is perceived as having all the necessary characteristics of what it takes to be a good leader and Prime Minister. When you take the average across the six metrics we tested, Javid scores the second highest, only trailing behind Ruth Davidson, who faces many barriers as she is not currently an MP. Javid tops the charts on two measures, with 64% thinking he is “up to the job” and 69% thinking he is “competent”. His only comparable weakness is on ideology where he comes slightly behind Rees Mogg, Boris Johnson, and Michael Gove. But even on this metric a majority (59%) of members think he shares their political outlook and he is still ahead of Jeremy Hunt, Penny Mordaunt and Gavin Williamson. None of this is to say that a Javid victory is guaranteed, or even close to it. Events are still developing and the situation is changing on an almost daily basis. Furthermore, as is often pointed out, there isn’t currently a vacancy, so we don’t even know when the next leadership election will take place. But as things currently stand, through the current chaos and uncertainty, our polling tells a clear story. Savid Javid is currently best placed to be the next Conservative leader, and possibly the next Prime Minister.